The advent and innovation of computer technologies for composing has dramatically and rapidly changed the classroom environment and even the curriculum with which writing teachers now find themselves charged to teach writing. 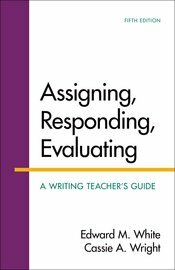 Assigning, Responding, Evaluating: A Writing Teacher’s Guide is designed to help the teacher create writing assignments, evaluate student writing, and respond to that writing in a consistent and explainable way. But it also suggests ways that writing programs can take advantage of our new digital environment and meet the increasing demands for accountability, without decreasing the role or creativity of teachers, or the importance of writing instruction to college education.